Destruction of leukaemia blood cell, computer illustration. Conceptual image for leukaemia treatment. Acute myeloid leukemia (AML) is an aggressive cancer that led to over 10,000 deaths in the United States last year. While AML is the most type of leukemia in adults, thankfully, overall, this disease is relatively rare accounting for only about 1% of all cancers. Though there are therapeutics available to treat AML, a new study by a team of researchers led by investigators at Cambridge Institute for Medical Research in the U.K. has identified a potentially interesting new therapeutic target that could also be an underlying factor in the disease development. EZH2 is an epigenetic protein that can control the activity of hundreds of genes by chemically modifying the histone proteins that package up the cell’s DNA. Increases in EZH2 activity are thought to promote the development of a variety of human tumors, including breast and prostate cancers, and several clinical trials are currently investigating whether drugs that prevent EZH2 from modifying histones could be used as cancer treatments. 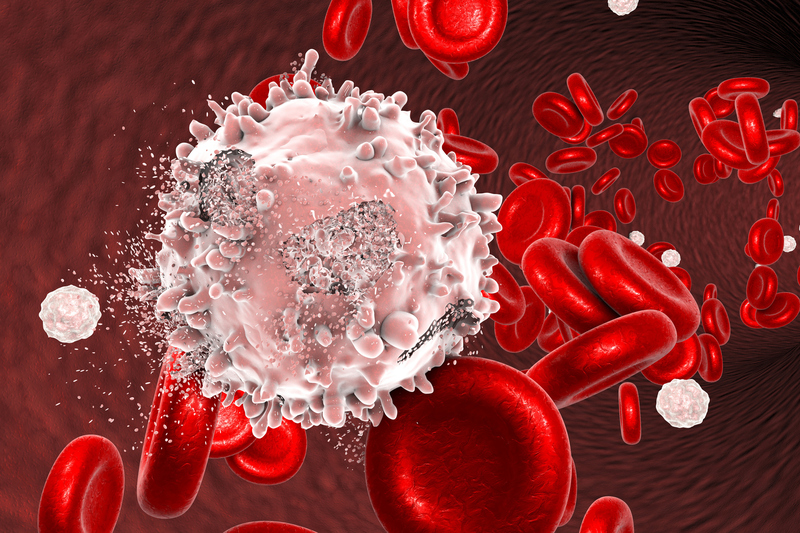 Whether EZH2 also promotes the development of blood cancers like AML is unclear. However, some evidence suggests that the epigenetic protein many actually prevent AML and other myeloid malignancies. “We have examined the importance of cellular context for EZH2 loss during the evolution of AML, where we observed stage-specific and diametrically opposite functions for EZH2 at the early and late stages of the disease,” the authors write. In the current study, the researchers found that mice lacking EZH2 developed AML much faster than usual, indicating that the protein does indeed delay the development of AML. However, once AML had fully developed and established itself in the mice, deleting the EZH2 gene or inhibiting the EZH2 protein with a drug disrupted tumor growth and significantly prolonged the animals’ survival. Inhibiting EZH2 also prevented the growth of AML cells isolated from patients. The British researchers found that EZH2 has conflicting effects on the development and maintenance of AML because the protein regulates almost completely different sets of genes at early and late stages of the disease. For example, during the initial stages of AML, loss of EZH2 causes cells to increase production of a transcription factor called Plag1 that accelerates the development of leukemia. But inhibiting EZH2 at later stages of AML has no effect on Plag1 levels.